Some time ago, Mark blogged an interesting article about running objects from extensions. You can read it here: https://markbrummel.blog/2017/05/20/tip-58-run-extension-objects/ . Works like a charm for Extension objects as well :-). What about the Web Client? Well .. Duh ;-). Only, the Web Client only supports to be able to run a Page or a Report. So in the latest version of my Powershell-modules, I included a function to support that: Start-NAVApplicationObjectInWebClient. So, I need to have a new project with powershell-stuff to combine with my AL development? This is just a simple example where I included a PowerShell-script in a subfolder of the workspace of an al-project. 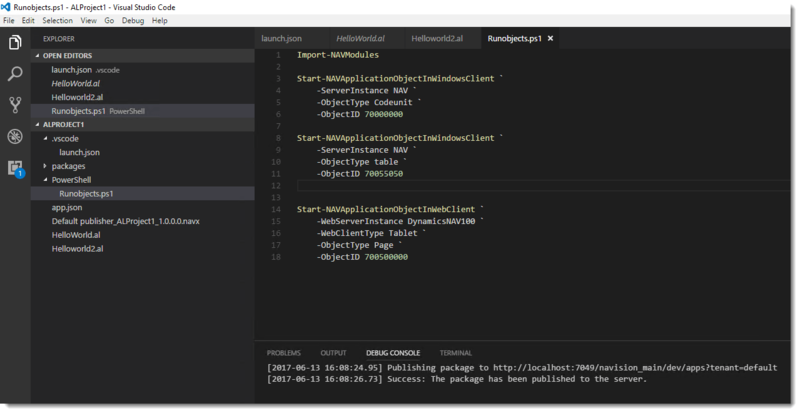 It keeps being an al-project (mind the “launch.json”, but I’m able to execute Powershell as part of the workspace. Not with F5, but with F8 (execute the selection).